Systems: 15x1, HAx1, 130/705H, SY2020, SY2031, 206x15, PFx130. These needles have a flat side ground on the shank to assure proper alignment with the point of the hook. (Intended only for machines designed for Flat Shank needles). 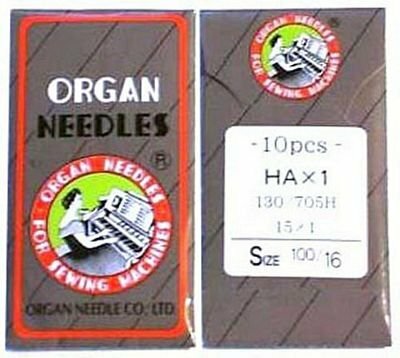 This is the standard needle with a flat shank and regular sized eye for use with most home sewing machines and home sewer based embroidery and quilting machines. Regular Point. For machines by: Bernina, Brother, Elna, Husqvarna, Janome, Juki, Melco, Necchi, Baby Lock, New Home, Pfaff, Poem, Riccar, Simplicity, Singer, Viking, White & more. 10 needles per package. Sold by the package. Not carded.